With modern day stress and fast pace living, it is difficult to maintain high levels of energy necessary to keep going all day long. 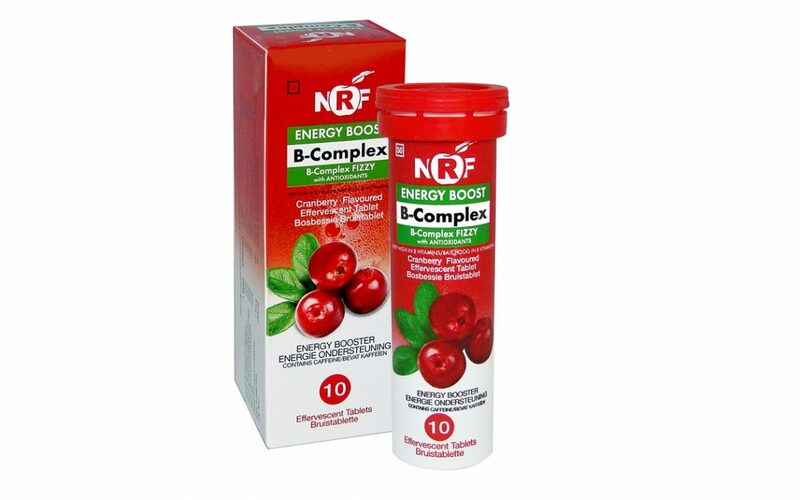 NRF B-Complex fizzy is a delicious, cranberry flavoured effervescent tablet with antioxidants which helps to boost energy effectively. A tablet should be taken daily in half a glass of water. B1 (thiamine) ensures that the body can produce new and healthy cells. This vitamin has anti-stress properties, can help boost your immune system and is vital for the breakdown of simple carbohydrates. B2 (Riboflavin) can help prevent aging and reduce the risk of heart disease. It is essential for the production of red blood cells and haemoglobin which help the body receive oxygen. B3 (niacin) helps increase the levels of HDL (good cholesterol) in the blood and has been known to help with skin conditions such as acne. B5 (pantothenic acid) can be found in many foods in small quantities where the main uses include breaking down fats and carbohydrates for energy and the production of important hormones such as testosterone. B6 (Pyridoxine) has several different qualities. Firstly, it works to regulate blood levels of homocysteine, which is an amino acid associated with heart disease. It also helps to body to produce hormones such as serotonin and melatonin, as well as norepinephrine. These are our sleep and stress hormones that alter mood and energy levels. It may also improve the condition of patients who suffer from arthritis. Vitamin B7 (biotin), also known as the beauty vitamin, has several benefits in relation to appearance, as it has been linked with improving the appearance of skin, hair and nails. There have also been studies that suggest that vitamin B7 can help to control blood glucose levels, suggesting that supplementation can be beneficial for those who suffer from diabetes. Folic Acid has several key benefits and has been linked to the prevention of memory loss, as well as improving depression. The main role of B12 is to aid the other vitamin B supplements in completing their roles. A lack of vitamin B, especially B12, can potentially lead to anaemia, which is a low red blood cell count. B12 deficiency includes fatigue, breathlessness, headaches, dizziness, lack of appetite, weight loss, sore tongue, mouth ulcers, pins and needles, irritability and depression. *NRF B-Complex is free from Tartrazine, aspartame, gluten, preservatives and yeast and is safe for diabetics. It is not recommended for pregnancy or children as it does contain a small amount of caffeine. NRF B-Complex fizzy is available from Dis-Chem and independent pharmacies for R59.99.